Like Fanny Mendelssohn and Clara Schumann before her, Imogen Holst (1907-1984) spent more time caring for the compositional careers of the men in her life than focusing on her own creative efforts. Holst devoted many years to editing scholarly editions of her celebrated father Gustav’s musical works and assisting Benjamin Britten. She exercised her own considerable talent as a composer only sporadically in between performing her many other duties as an administrator, orchestrator, conductor and confidante. 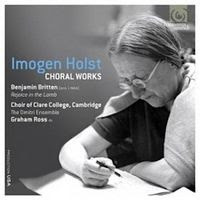 As such, Harmonia Mundi’s release of Holst’s choral works performed by the robust, 29-member Choir of Clare College Cambridge with conductor Graham Ross, provides a valuable introduction to an area of the musician's life that has until now been woefully neglected. The album includes titles unheard since their first performance as well as the world premiere recording of Holst’s 1952 orchestration of Britten’s Rejoice in the Lamb festival cantata. Holst’s characterful writing for strings, winds and percussion — sensitively embodied by the Dmitri Ensemble — adds color and depth to Britten’s well-known 1943 piece originally scored for choir and organ. But it is upon Holst’s textually-sensitive and harmonically-vibrant writing for voices, and women’s voices in particular, that the strength of this recording truly rests. The beginning of Welcome Joy and Welcome Sorrow, the composer’s 1950 setting of six poems by John Keats for female chorus and harp, immediately shows off Holst’s aptitude for word-painting and harmony. A simple harp ostinato supports Clare College’s warm-sounding women as they sing “welcome joy” on an ecstatically splayed, dissonant chord before retreating to the darker, closer harmony of “welcome sorrow.” Even in her works for mixed chorus, Holst’s writing for sopranos and altos shines. The opening of the haunting “Agnus Dei” section of the composer’s 1927 Mass in A Minor features a flowing, plaintive chant passage for high voices. The singers glide in perfect monophony, setting the movement’s bittersweet tone. In much of her life, Holst may have prioritized the needs of the famous male composers around her. But her choral works unabashedly celebrate the female.